Since setup had begun on Thursday, but I arrived on Friday, the first order of the day for me was to see what creations had been put on display the day before and begin preparations for the incoming ones that day. I began setting up my own Lego creations while rearranging the layouts on the tables to accomodate people as they arrived with their displays. As we jockeyed for space, eventually everyone was out on display by mid afternoon. My own MOCs (My Own Creation) to display this year was a combination of one I have displayed before and a few new ones. As always, Touristbot 2.0 was the first one out of the crate to begin taking pictures of the event. The new MOCs I brought were a remote controlled Lightning McQueen and a remote controlled Lego Helicopter (which was able to fly a little but still needs work lightening). The other MOCs I brought with me were Tux The Penguin, the TARDIS, the Green Lantern, and a few video game sprites. At 4pm, I gave another talk. This year, my topic was Promoting Your MOCs Online. The talk was a social media marketing 101 with a case study on how the TARDIS was promoted. Unfortunately, it wasn’t as streamlined as I would have liked due to a lack of microphone, spotty wifi and less preparation time than I would have liked due to my trip to Florida. Overall, I think I got my message across and hope it was informative to all who came to listen and could hear me. After my talk, I had some time to check out the charity auction to support SladeChild Foundation before heading off the to the organizers’ dinner. A fun dinner with all the other volunteers mixing good food, good drinks and some wholesome shenanigans. Afterwards we returned to the convention center to relax for a couple hours in the calm before the public storm. After a quick breakfast at the hotel, it was off to the convention center to make last minute preparations for the throngs of people. By 11am, I had heard that people were wrapped twice around the building waiting to get in, where they were approached by people offering Kre-O, a Lego competitor. It seems that when you run the largest Lego event in the country, the competition takes notice and attempts to get in on the action, but their marketers were quickly dispatched and 9,100 people came through the doors during public hours. Once the public left, it was time to grab some dinner, pick up some libations and return for “Adult Swim,” a time when adults can relax without children around and play some games and drink. My game of choice was Texas Hold ‘Em poker, where I faced off against 30 opponents over the course of the game. Moving from table to table as my stacks of chips ebbed and flowed until I emerged victorious and took first place and the prize that accompanied my victory. With preparations underway for the second day of the convention, I received a couple emails to my phone. The first was telling me who won the award for Movie/TV/Book, so I could award the “Brickee” to the winner. 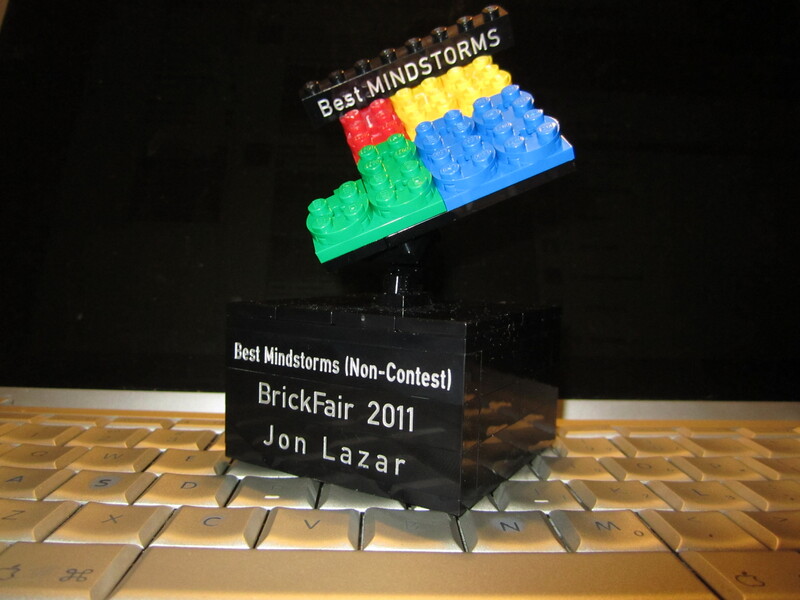 The second was informing me that Touristbot 2.0 had won the best Mindstorm Brickee. Both Touristbot and I were honored by the award and proud to be recognized by our fellow builders. As the clock struck 11am, the public returned and 7,600 people paraded through the convention center to marvel at what had been built. The second public day was as exhilarating and as exhausting as the previous day, but well worth it seeing the looks of amazement and delight on their faces. Once it was 4:30, they were sent out and we began to break down the displays, tables and all the other accoutrements associated. Once the truck was packed, we stayed for closing ceremonies and hit the road back to New York. It’s always inspiring to be surrounded by 1,000 creative people who encourage each other to create new ideas and build new structures to amaze and delight. 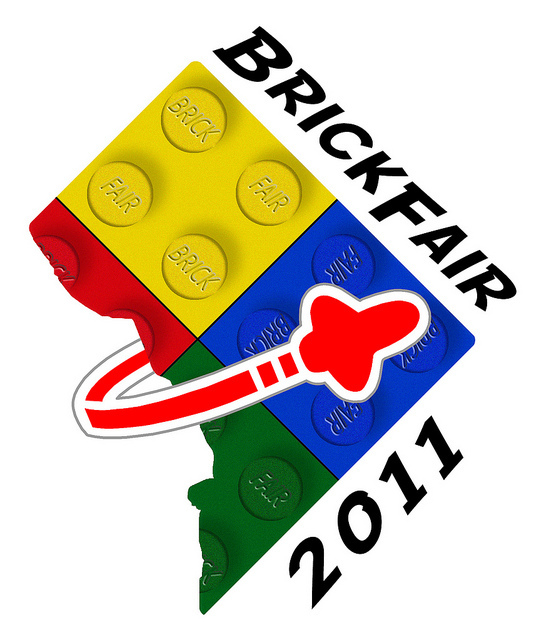 Leaving BrickFair is like the end of summer camp, where you say goodbye to all your friends and look forward to seeing them all next year and see what they’ve done in the interim and what they’ll create in the time between.